Before there were mammals on land, there were dinosaurs. And before there were fish in the sea, there were cephalopods—the ancestors of modern squid and Earth’s first truly substantial animals. Cephalopods became the first creatures to rise from the seafloor, essentially inventing the act of swimming. With dozens of tentacles and formidable shells, they presided over an undersea empire for millions of years. But when fish evolved jaws, the ocean’s former top predator became its most delicious snack. Cephalopods had to step up their game. Many species streamlined their shells and added defensive spines, but these enhancements only provided a brief advantage. Some cephalopods then abandoned the shell entirely, which opened the gates to a flood of evolutionary innovations: masterful camouflage, fin-supplemented jet propulsion, perhaps even dolphin-like intelligence. 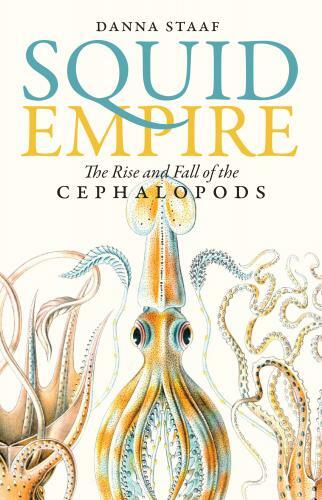 Squid Empire is an epic adventure spanning hundreds of millions of years, from the marine life of the primordial ocean to the calamari on tonight’s menu. Anyone who enjoys the undersea world—along with all those obsessed with things prehistoric—will be interested in the sometimes enormous, often bizarre creatures that ruled the seas long before the first dinosaurs. DANNA STAAF earned a PhD in invertebrate biology from Stanford University. She lives in Northern California and has contributed to KQED, San Francisco, and wrote “Squid a Day” for the blog Science 2.0.